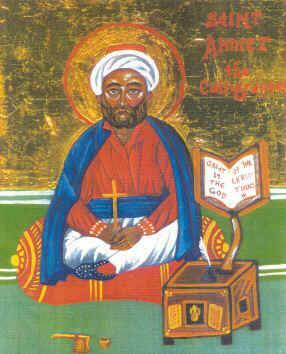 Saint Ahmed (or Ahmet) Kalphas came from a Muslim family in Constantinople, and was raised as a devout Muslim. He worked as a secretary (deftedar) in the office of the Chief Secretary of the Ottoman Empire, that is in Ottoman terms, within the Sultan’s Chancellery as Scribe of the Second Rank. Thus Ahmed was a man of considerable power and influence due to this high social position, and from all accounts led the typical routine life of an Ottoman official. However, being an unmarried man, Ahmed had taken a Christian slave woman to be his concubine in accordance to Islamic law and the customs of his day. The woman in question was a Russian captive who adhered to the Orthodox Christian faith. In any case, Ahmed allowed this woman as well as an elderly Russian woman who attended her, given their piety, to continue practicing their Orthodox faith freely. This was not an unusual practice in “mixed marriages” of this kind. Hence, Ahmed’s concubine and the elderly Russian woman would attend church services regularly, particularly on feastdays. It also seems that one of the reasons why Ahmed allowed this to occur would be the sweet fragrance that emanated from his partner’s mouth after attending the Divine Liturgy. As time went passed, his partner’s faith slowly but surely became an important influence in his life and he became curious. Particularly given that the sweet fragrance kept emanating from her mouth which he found inexplicable. On one particular feastday, Ahmed approached her and asked what she had eaten, and after much urging, told him that she had eaten nothing except the bread (antidoron) blessed by the priest and the holy water (aghiasmos) she had drunk from church. This of course fed his curiosity causing him to be seized with an ardent desire to see how the Christians receive this bread and what were the rites practiced in their churches. Ahmed then sought one of the priests who served in the patriarchal church of Saint George at Phanari (Fener) to reserve a discreet place for him in the church when Patriarch Iakovos I was celebrating the Divine Liturgy so he could observe. 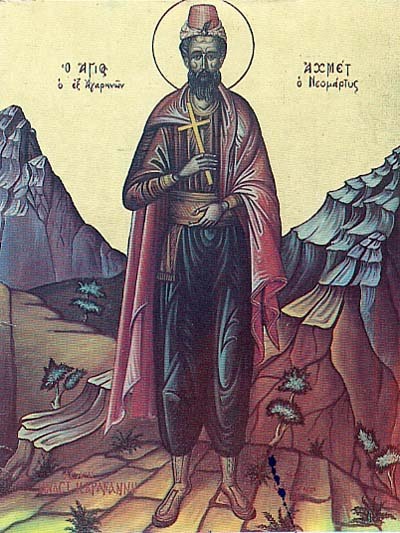 When the day came, Ahmed dressed in Christian clothing, thus removing his white turban (the symbol of an Ottoman Muslim) and donning the blue turban of a Christian and proceeded to Saint George’s in Phanari. At the moment of the Great Entrance in the Divine Liturgy, he saw the priest who was carrying the chalice walking without touching the ground and bathed in light. When Patriarch Iakovos blessed the people, he saw rays of light shooting from his hand and settling upon the heads of the faithful, noticing that he alone was deprived of this divine light. This event caused the blessed man to believe with all his heart unhesitatingly, and so he sought to be catechised in the Orthodox faith and baptised into the Church. For quite some time he practiced his Orthodox Christian faith in secret, since he would not only lose his livelihood, but his life also, in accordance to Islamic law that viewed Ahmed as an “apostate” of the faith and liable to the death sentence if he did not recant. In time though, the truth was bound to come out given the numerous formal dinner functions that Ottoman officials attended regularly. At these functions drinking was permitted (despite Islam forbidding such a practice). But also discussions of politics, religion, economics and so forth would take place at these various functions, which would normally become heated debates. It was during these functions that Ahmed would make various slips which brought his adherence to the Islamic faith into question by his fellow colleagues. The calligrapher of the third rank, who coveted Ahmed’s place, made concerted efforts to poison the Chief Secretary and all the staff against Ahmed, while seeking any opportunity to stir trouble against him. It had been said that the calligrapher of the third rank’s resentment for Ahmed also stemmed from the fact that Ahmed was far more talented and competent in his task than he. the most delightful, was pilaf with yogurt – for was this not the food of the righteous in paradise? Yet when Ahmed was asked his opinion, his zeal could not be contained and he cited in a very calm and balanced fashion, that faith in Christ was the greatest thing in the world. And that great was the God of the Christians for everything else paled in comparison since it was the True Faith. With this confession the other guests threw themselves upon him in great fury beating him and dragging him before the authorities. Not long afterwards when things had settled he was summoned before a tribunal that interrogated him to determine whether he was a Christian and thus an “apostate”. Before the chief Judge (Kadi) and his colleagues, Ahmed replied that he had embraced the Orthodox Christian faith after a revelation, and that he hoped with all his heart that they too would realise in turn the deception of Islam. Infuriated the Chief Judge had him thrown into prison with the common prisoners and ordered that he be left without food and drink for six whole days. Appearing once again before the tribunal after his brief incarceration, Ahmed declared that the fast had brought about his purification, and that Christ had revealed the deepest mysteries of the Faith to him, so strongly confirming his resolution that it would be easier for the magistrate to mould rock and fire with his hands than to make him change his mind. He was then accused before the Sultan himself, and, to the threats of beheading, replied that such a death would be the height of joy. The Sultan immediately pronounced the death sentence, and Ahmed was beheaded on 3 May 1682, receiving the crown of martyrdom under the name of Christodoulos. His body was thrown on the shore of the Bosphoros, in a place that was lit for several days by a supernatural light. Pray for us Neo-Martyr Ahmed. Amen. Thy Martyr Ahmed, O Lord, in his courageous contest for Thee received the prize of the crowns of incorruption and life from Thee, our immortal God. For since he possessed Thy strength, he cast down the tyrants and wholly destroyed the demons’ strengthless presumption. O Christ God, by his prayers, save our souls, since Thou art merciful. Dedicated to all Turkic Orthodox faithful – V.M. *2. Antidoron, which literally translates as “instead of the gifts”, or put another way “instead of the Holy Eucharist”, is a liturgical bread blessed by a priest directly after the Holy Eucharist has been prayed over with the Epiclesis (Invocation). It is taken from the Prosphora (Offertory Bread) that the faithful bring to a church, from which the priest also selects the portion that becomes the “Amno” (literally “Lamb”) which is the Eucharistic Bread. Antidoron though, is not the Holy Eucharist, but is distributed amongst all who attend a church after the conclusion of a divine liturgy. It is especially meant for those who did not go up to receive Holy Eucharist or are not baptised members of the Orthodox Church. *3. Christians were forced to wear dull and drab clothing while the Muslims wore rich, illustrious garments, in this way trying to signify that Islam was “bright” and “luminous” compared to Christianity. *4. Crypto-Christians were common during the Ottoman occupation, especially by Muslims who converted to Christianity since the Quran itself says that apostasy from Islam deserves death. Crypto-Christians can still be found in predominantly Muslim countries. It is for this reason also that we do not know the Christian name of Saint Ahmed. *5. The Narghile (Hookah) is a smoking pipe that filters smoke via water. It is customary that various flavoured tobaccos are smoked, but according to historians, the origins of this Middle Eastern water pipe, first developed in Asia Minor as a means to apply sedatives or anaesthetics to people undergoing surgery. The chief item being opiates. However, the smoking of opium and hashish seem to exit the medical environment, and became quite a common-place thing for millennia in the Greco-Middle Eastern region. It is only with the introduction of tobacco from the Americas, that made the narghile socially acceptable and its use widespread amongst commonfolk as well as the upper classes. *6. It was and is believed by certain Mohammedan religious experts, that the food of paradise is the rice dish known as “pilaf” that is served with yoghurt. For those of you who are not familiar with pilaf, there are many recipes, versions and variations. But the commonality between them all, is that the rice is cooked in a somewhat dry manner using small amounts of water, juice or alcohol, depending on place and custom. This is because, the rice is not boiled in water, but it is similar in texture to the Italian risotto. The difference being, that risotto is cooked in copious amounts of cheeses, creams and butter. I received an email from one of our readers indicating something very bizarre. The life of St Ahmed the Calligrapher has been placed on a Roman Catholic website which asserts that St Ahmed is a Saint of the Roman Catholic Church and as such is commemorated by the Roman Catholic Church…. And this is bizarre, in as much that in having taught religious education in Roman Catholic schools myself, there is an aversion to touching anything that is not from Western Christendom, let alone outside of the Roman Catholic Church. 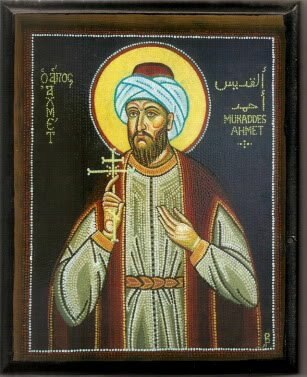 Dogmatically, according to traditional Roman Catholic theology and teaching, St Ahmed is not and cannot be viewed as a Saint of the Roman Catholic Church as he was neither a baptised Roman Catholic, nor confessed the doctrines of the Roman Catholic Church, and in his time was considered a heretic by Rome…. So I am curious to hear how the Church of Rome explains this bizarre twist, as the Saint himself bore witness to miracles within the Orthodox Church that brought about his conversion. To which he chose to be catechised and baptised in the Orthodox Church, and become a partaker within its sacramental and liturgical life….In Ahmed’s time it would involve renouncing the heresies of the “Papists” as well as his own “Hagarene” (Muslim) religion. And furthermore, in his confession of Faith, he asserted even to the last drop of his blood, his Orthodox Christian Faith. So how can he be a Saint of the Roman Catholic Church?